Treat yourself to an afternoon of orchestral Filipino classics. 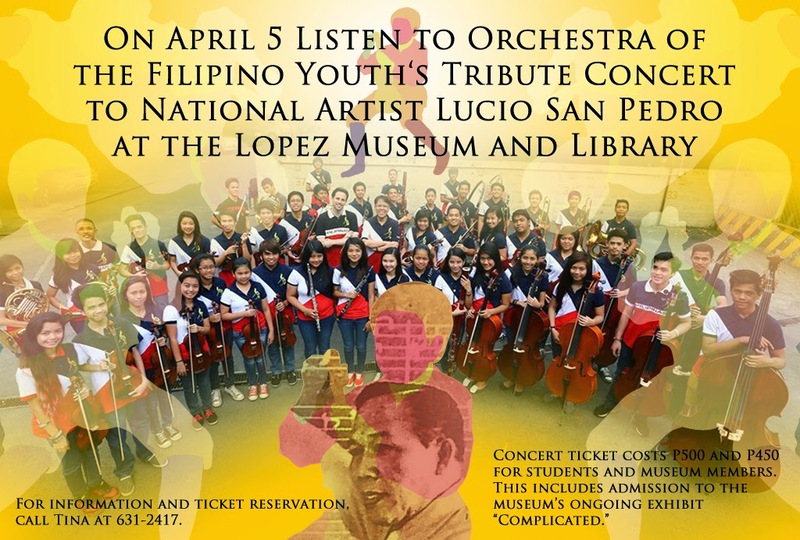 On April 5, the Lopez Museum & Library and the Orchestra of the Filipino Youth (OFY) pay tribute to the genius of National Artist for Music, Maestro and Professor Lucio D. San Pedro. The OFY Quorum and Prep Club will play songs written by San Pedro, such as “Sa Ugong ng Duyan”, “Katutubong Awitin”, and “Leron-leron Sinta”. San Pedro, a prolific artist with more than 60 years of artistic creation, is noted for his works that are highly evocative of the folk elements. Through his compositions, he strove to reflect the Filipino soul and stayed true to his musical philosophy of “creative nationalism.” He has written hymns, masses, choral works, songs for solo voices, chamber music, incidental music, even background music for movies. Conferred National Artist for Music in 1991, his popular compositions include “Sa Mahal Kong Bayan”, “SimbangGabi”, and “Sa Ugoy ng Duyan”. “Complicated” exhibit explores at the complex relationship of the Philippines with its colonial pasts. It features commissioned works by guest artists Leslie de Chavez, Mike Adrao, and Ea Torrado juxtaposed with works by Juan Luna, Felix Resurreccion Hidalgo, Juvenal Sanso, and other artworks from the collection. The Lopez Memorial Museum is at the ground floor, Benpres Building Exchange Road corner Meralco Avenue, Pasig City. Museum days and hours are Mondays-Saturdays, 8am-5pm, except holidays. For information and ticket reservation, call Tina at 631-2417. Previous Previous post: Taking students to an art museum improves critical thinking skills, and more.